Over the years, I have kept coming back to an image: a young writer, a twenty-six-year-old Indian man, sits at a desk in a small flat in Streatham Hill, a modest area of South London. It is 1958, and he is working on a long book that will become, in time, one of the great novels of the twentieth century. The young writer is unimaginably confident and unimaginably vulnerable: privileged in some respects (he went to Oxford, and he knows that he is more talented than his literary peers), utterly powerless in others (he is an Indian at work in the old, disdainful imperial metropolis, but he is not even from India—he grew up in Trinidad, where his grandfather was brought over as an indentured laborer to work on the sugarcane plantations). The world lost a great foodie and educator in Anthony Bourdain. We knew Anthony Bourdain first as the host of No Reservations, but before that TV gig, he was a multidecade veteran of the restaurant biz. Kitchen Confidential ocuses on his initiation into the restaurant industry – both as a worker and later as an owner. It is invaluable reading for anyone thinking – like some of my entrepreneur students – of opening a restaurant or bar. A lot of hilarious and insightful information. Ellison produced more than 1,800 pieces of writing, beginning in 1949 when his hometown Cleveland News gave him his first byline when he was 15. Stephen King, in Danse Macabre, his 1981 homage to horror fiction, praised Ellison’s Strange Wine collection of short stories for being among the best published between 1950-80. What are you conveying to others through your body language and what are other people telling you with theirs? These books go beyond the obvious – like crossed arms – and talk about the significance of eye movements, the position of feet and other interesting tells. You are guaranteed to learn something! Our books on body language. All Abraham Verghese books here. I first became aware of Abraham Verghese through his best-selling book, My Own Country, which chronicled the AIDS epidemic in a small Tennessee city (which also happens to be my hometown). Dr. Verghese wrote the book based on his own experiences, and I can tell you that it is completely accurate. Since then, Dr. Verghese has gone on to write nonfiction about losing a tennis partner to addiction as well as fiction. Dr. Verghese currently works at Stanford University. Our Tom Wolfe holdings here. In a career that spanned more than half a century, Tom Wolfe wrote fiction and nonfiction best-sellers including The Electric Kool-Aid Acid Test and The Bonfire of the Vanities. Along the way, he created a new type of journalism and coined phrases that became part of the American lexicon. Wolfe died Monday in Manhattan. He was 88. 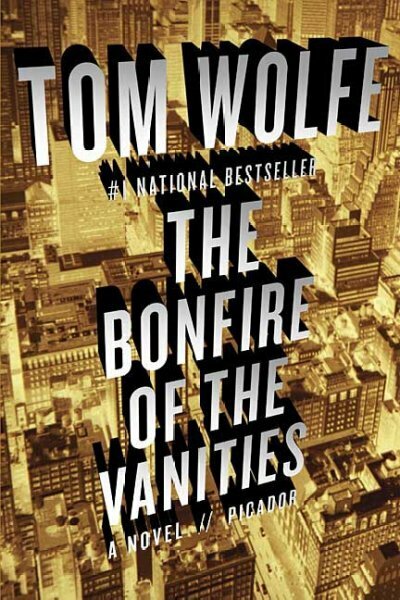 The novel that grew out of Wolfe’s research — The Bonfire of the Vanities — was the tale of Sherman McCoy, a wealthy bond trader who loses everything after a wrong turn in the South Bronx with his mistress in the passenger seat. It was a huge critical and commercial success. Wolfe had written the novel from the same “you are there,” stream-of-consciousness, first-person perspective that he pioneered in his nonfiction 20 years earlier. Our Philip Roth material here. Interested in writing nonfiction, international journalism, or some of the best reportage ever put on paper? Check out our Rsyzard Kapusckinki books (yes, we have them in English). Kapusckinki wrote about colonialism in Africa, the breakup of the Soviet Union, the Soccer War in Central America (my personal favorite and you’ll have to get the book to get the whole story). Often travelling outside the major cities, Kapusckinki regales us with stories of lemonade stands in Central Asia, the circular logic of policeman at an African road checkpoint, mountains of frozen ice from perpetually broken pipes in Siberia, and his comical attempts to navigate a city during a wartime blackout.